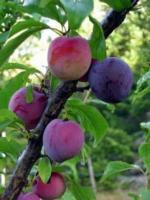 Plum trees are one of the best-adapted fruit tree species for almost anywhere in California. They are easy to grow. Available rootstocks are very tolerant of wet winter soils; they bloom late enough to avoid most spring frosts; and they have few pest problems. Plum trees get relatively large and require 12–18 ft. spacing. Most plums, but not all, require cross-pollination to set adequate crops; plan to plant two different varieties. There are two different kinds of plums: Japanese, Prunus salicina, and European, Prunus domestica. European types are either very sweet fresh plums or prunes used for drying. Both types of plums require about 140–170 days to mature the crop. Most Japanese plums bloom earlier and mature earlier. They typically require less chilling than European plums. Spray trees with dormant oil to control San Jose scale, aphid eggs, mite eggs. Prune 20% last year’s growth to let light in. Spray trees with a fungicide to control brown rot as blossoms appear. 2–3 sprays may be needed if weather is rainy, cloudy. Fertilize mature trees, use 1–2 lb. urea or 20–40 lb. manure/tree. Irrigate about every 2–3 weeks or drip irrigate every day. Fertilize trees just prior to irrigation. Use lower rates for vigorous trees. Thin fruits to about 4–6" apart. If larger fruit is desired, leave fewer fruit. Control aphids if severe damage (50% leaves curled and aphids present). Fertilize young trees monthly (April–July). Use 4–8 oz. urea or 10–20 lb. manure/appl. Water in. If drip irrigated, do not exceed 1 oz. urea/emitter/appl. Drip irrigate daily or sprinkler irrigate about every 2–3 weeks. Maintain the area within 3' of the tree free from weeds with an organic mulch. Fertilize and irrigate trees just after harvest with 1–2 lb. urea or 20–40 lb. manure/mature tree. At leaf fall or before major rains, spray to prevent shot hole fungus with fixed copper.